Karen Newhouse’s excellent diagram (below) is one that I have come back to again and again over the years to visualize how it is that you relate to your work. Your career passion is at the intersection of your skills, interests, and values as they are pushed and pulled by the forces and factors that inform the way that you work. For some people, it is all about the work environment: What the colleagues are like, and who the clients are. How you interact and how often. For others, it is more about the tasks performed: what will I be doing all day long? 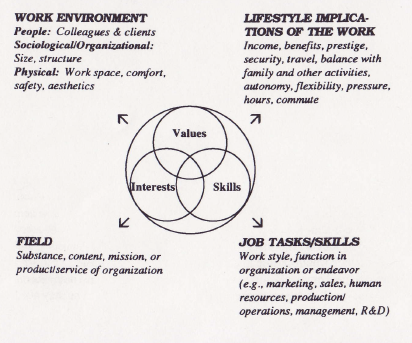 For yet others, the tasks don’t matter so long as the work is in a field that aligns or the lifestyle implications suit. Our life’s calling can and does often happen while we are busy making other plans, but in retrospect, we can see that it exists at the intersection of our skills, interests, and values and orients to the factors above that make it uniquely suited to us. Posted byannatrester September 21, 2014 October 19, 2014 Posted inCareer ExplorationTags: What can you do with a degree in linguistics?